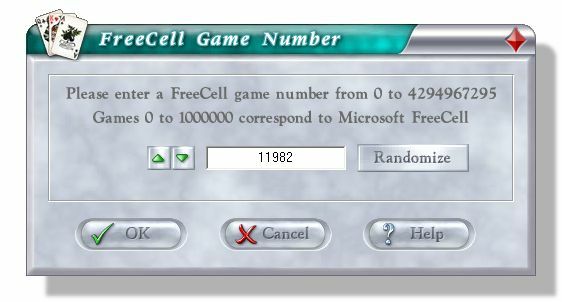 If you enter a game number between 0 and 100000, you will be able to play the exact same card layout as a Microsoft FreeCell game number, including the infamous game number 11982 which is the only unsolvable deal in the first 32000 games. Numbers above 100000 will be unique to Solitaire City. It would be unfair to allow a scoring system for this type of game as you could simply practice the same deal over and over again until you were able to complete it in record time. Therefore, the timed scoring system has been removed for Rule 7 which has only been included for those people who like to solve the Microsoft game numbers.